2 or more 30% $29.97 per pc. Shop now for bedding sets on Ambesonne.com to reflect your style in your bedroom decoration. 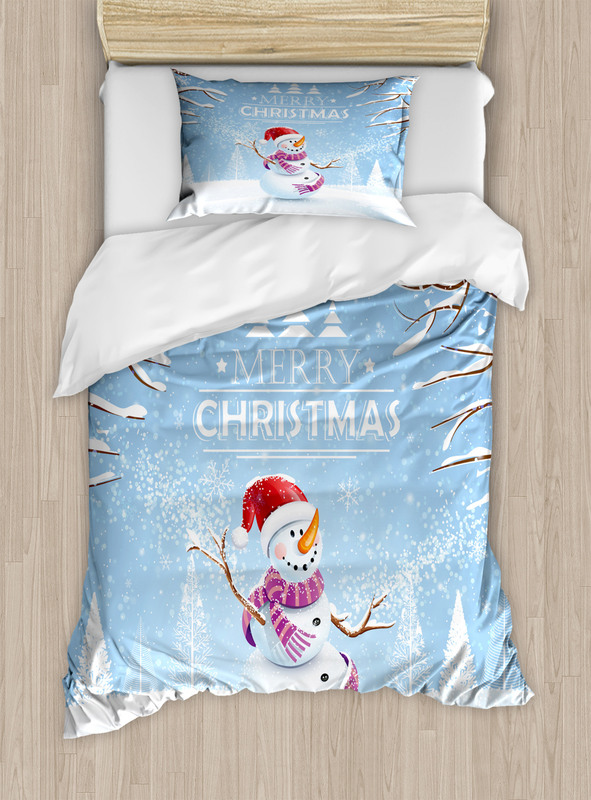 20299 themed Snowy Winter Noel Duvet Cover Set will add a chic element to your bedroom decoration with its unique true color. Take now advantages of cheap 20299 duvet sets and bed sheets online with various size options from King to Queen. You will be impressed by exclusive and high-quality comforter set selection by Ambesonne. You can always find eye-catching 20299 duvet covers and bed sheets that will suit your style and they are suitable for every design. It will only cost $99.90 with free shipping. Ambesonne'sduvet covers are full of fun and comfort for you and your family. Duvet insert is not included in the set. You will miss Ambesonne's silky touch and vivid blast after the second you put your duvet in the duvet storage bag in the summer time. I compliment Your service and quality. The design and pillow shams have transformed my bedroom into a show palace. Excellent quality that surpasses the vision I had anticipated. As a 30 something female obsessed with females I had to have this. It paired really well with basically everything I have in the bedroom. This duvet cover is the dream of every shark lover. Its colors are really nice and goes really well with the head of my bed. I really wish it had corner fasteners but when the design is this good you can forgive these kinds of things. This was a gift for my daughter in her birthday. She always liked space and stars so she loved both the print and the material only downside is we did not check the size correctly so the pillow insert was small for the cover. We had to buy additional inserts. But other than that it is a great set. I can proudly recommend it. Print on the duvet cover isn’t nearly rich in the site but pillow cases are top quality. After putting an insert it looked better. And immediately I have started getting compliments. People seem to like it more than me J It took a while to get the product but after getting so much compliments I cannot complain. Beautiful duvet cover. Zipper at the bottom is a nice addition from the normal button ones. I adore the print and material but there is a downside. There is no duvet ties in the cover so insert might move after use. I might have to sew some strings in it later. I have received so many compliments already. So I can say that I am glad to have it. I like the cover because for this price you would expect a quality item and it shows. Cover was not thick nor thin. I originally bought it for my son he really enjoyed it. I would never think about replacing it or returning it. I am letting everyone in my area know that how quality and nice duvet cover is. I have received so many compliments that it made my whole month.